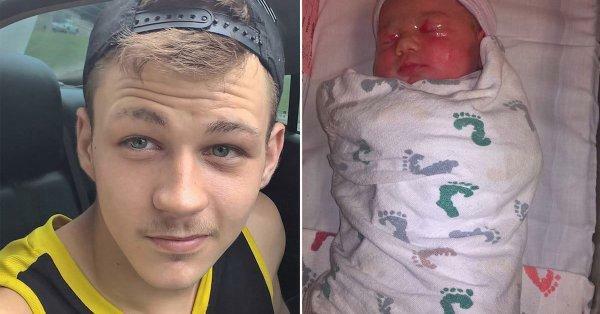 A 19-year-old Arkansas father is accused of despicably smothering his baby daughter, then turning desperate to revive her by shocking her. The teen father suspect has been identified as Tyler Buchanan. He has been charged with murder for the sorry death of his 2-month-old daughter Paisley on June 12. The police received a call in the early morning of the said day reporting about an unconscious baby. Officers then responded to a Van Buren home. The baby girl was brought to the hospital where she was pronounced dead. An affidavit for probable cause says that Buchanan initially told officers that he fed his baby around 5:30 a.m. and went back to sleep afterward. He claimed that when he awoke, he discovered that the baby was no longer breathing. The despicable father would later confess how Paisley really died. He told the officers that the infant was screaming and he was trying to get her to stop because he wanted to sleep. So he held the child’s head against his shoulder to keep her from breathing. Some social media users react to the story. It is not clear where the baby’s mother was when the horrible incident took place. Neither is it clear if the baby’s parents are staying together, or Buchanan at the time of the alleged crime has custody of baby Paisley. Should Buchanan be convicted of capital murder, he could face the death penalty or life in prison. He is in the Crawford County jail on Tuesday in lieu of $1 million bond. just when i thought that the news couldn't get any more depressing…. How sad! This shows any idiot can sperg out the sauce to make a child but that no way makes him a father. Fatherhood is earned and this shitbag failed miserably! It includes recovering ovules from a lady's ovaries and preparing them with sperm. This prepared egg Can Someone Write My Essay is known as a developing life. The developing life can be solidified to store it or exchange it to the lady's uterus. Tyler and the baby's mother were living together, but were no longer in a relationship. The mother was in the home asleep when the murder occurred. As soon as she woke up and learned her baby was not breathing she called 911. The baby's mother hopes Tyler receives the death penalty and wants justice for her daughter. Terrible, the fathers young age is no excuse to be that cruel and horrible! He should never be a father again! Life in prison. No death penalty. Let him sit and think about it for the rest of his exsistance. And let the boys in the joint remind him. Daily.